When Republican presidential candidate Mitt Romney unveiled his space advisory group at the end of January, one might reasonably have expected that the group would have gone to work producing some sort of plan for the candidate to run on in relatively short order. Five months later, there is no sign of such a document. However, two members of that body — former NASA Administrator Mike Griffin and his former deputy, Scott Pace — showed up in Cleveland this week to scare people with allegations that the Obama Administration plans to cut back staff at the NASA Glenn Research Center. They failed to mention, however, that Romney’s budget proposals would cut NASA’s spending plan even more. The one-page chart given to reporters came from Michael Griffin, who ran NASA during George W. Bush’s presidency, and shows that the agency could save $216 million between 2013 and 2016 by eliminating 244 human space flight jobs at Glenn and 825 similar positions at seven other NASA centers. 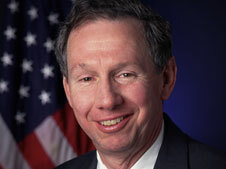 Griffin, a space policy adviser to Republican presidential candidate Mitt Romney, has frequently criticized President Barack Obama’s administration for failing to support human space exploration, and under-funding NASA. Griffin and former NASA associate administrator Scott Pace, who also is a Romney space policy adviser, repeated those criticisms Thursday at a news conference organized by the Cuyahoga County Republican Party, saying the potential cutbacks at Glenn showed the lack of a clear, coherent human space flight mission. Before we get into the meat of this controversy, let’s address one matter: Are we expected to believe that Griffin and Pace are just traveling around the country on their own, expressing their “personal concerns” about the Administration’s plans, with no connection to Romney despite advising his campaign on space matters? And that their presence in the key presidential battleground of Ohio is just a personal crusade? And the only group they could find to sponsor their press conference was the Cuyahoga County Republican Party? No. Sorry. That just doesn’t wash.
Whatever the case, neither Griffin nor Pace gave any hint as to what Romney would do with the American space program if elected. This probably explains why they insisted they were speaking on their own instead of for the campaign. And since Romney has no public plan, any effort to question them on the subject would have been futile. Show up in key state. Attack the Administration and its policies. Disavow any formal connection to the Romney campaign. Duck all questions about what the man who hired you would do if elected. A five percent across-the-board cut would trim at least $885 million from NASA’s $17.7 billion FY 2013 budget request in one fell swoop. NASA would have no more than $16.8 billion to spend. That is much more than the $216 million NASA supposedly would save over from 2013-2016 through personnel cuts. It is also significantly less than NASA’s $17.3 billion budget in FY 2008. So, the people of Cleveland actually have more to worry about from Romney’s overall spending plan than anything President Barack Obama has proposed.